Enhance the greenery in your yard in two ways using these Panacea Leaf Hose Guides. 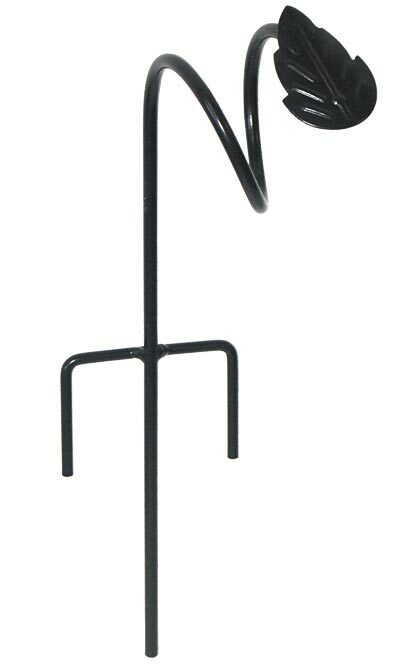 This set of four black, metal stakes perfectly corrals your existing garden hose, preventing it from running through your landscaping and damaging your plants. Each 12" tall stake inserts easily into your soil, thanks to the trident base, while a leaf shape tops them to enhance your yard. An open loop beneath each leaf elevates your garden hose off of the ground, and the hardy metal construction remains durable for many seasons. The black finish keeps each guide visible, and this set of four is great for lining a flowerbed. Add a fun hint of foliage to your garden hose care with these Leaf Hose Guides. Made in the USA. Note: This package includes 4 of the Panacea Leaf Hose Guides.